We were awake and on the hotel shuttle well before sunrise this morning to catch Delta’s 7 a.m. flight back to the Twin Cities of Minneapolis and St. Paul. Good-bye 90 degrees, hello . . . oh! Sunny and 50 degrees was a kind transition back to the real world! Thank you, Mother Nature! My sweetheart (SH) was off and running to work and I sat down at my computer to check flights for the next leg of our winter motorcycle adventure in a couple of months. The plan is that every 6 to 8 weeks throughout the winter we will fly to the city where our bikes are stored and ride over a long weekend to another warm city, gradually bringing the bikes back to Minnesota by the end of April or early May, weather being the key determining factor to the timeline and route. I am SO excited to explore some more beautiful new (to me!) territory in this great country! I want to take a moment to express my gratitude for my partner in adventure and life. SH and I partner so well on the planning and the execution of our adventures. We collaborate on ideas for where, when and how to travel; he does most of the route planning and hotel booking, I usually book the flights, if they are part of the itinerary. We get feedback from each other before making final arrangements. We are also very compatible travel companions; we’ve often traveled up to 10 days together, 24/7, with barely a sharp word between us. I really think the principles in my October 17 post, One must be great before Two can be better, provide the basis for our easygoing interaction with each other. And we have both “been around the block” a few times, and have sincerely and authentically applied our learnings to our personal growth and to our selection of a partner. AND, quite frankly, we are past the point in life when we let so many stressors impact our relationship – kids, finances, career demands, competing values, interests and ideas. I think we both gave up the overpowering need to be RIGHT a long time ago, too! Even though life can be crazy, and we still have stressors (granted, being awake with a teething baby all night is not one of them!) we make time with each other a priority. Another great adventure! 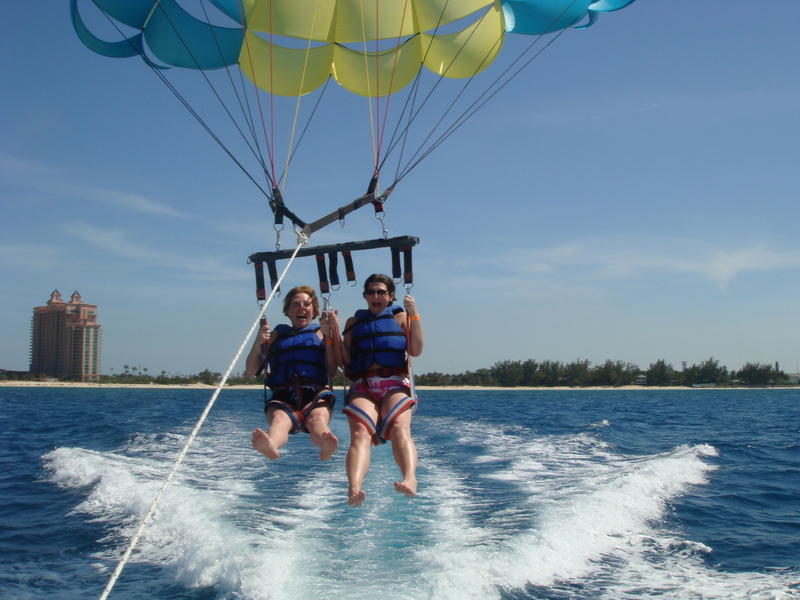 Here, I’m with one of my sisters in the Bahamas a couple of years ago. I am also grateful for the other great travel companions in my life — I’ve had really fun times with sisters, brothers and girlfriends. I’m entertaining a few ideas for adventures with them in the coming year as well. 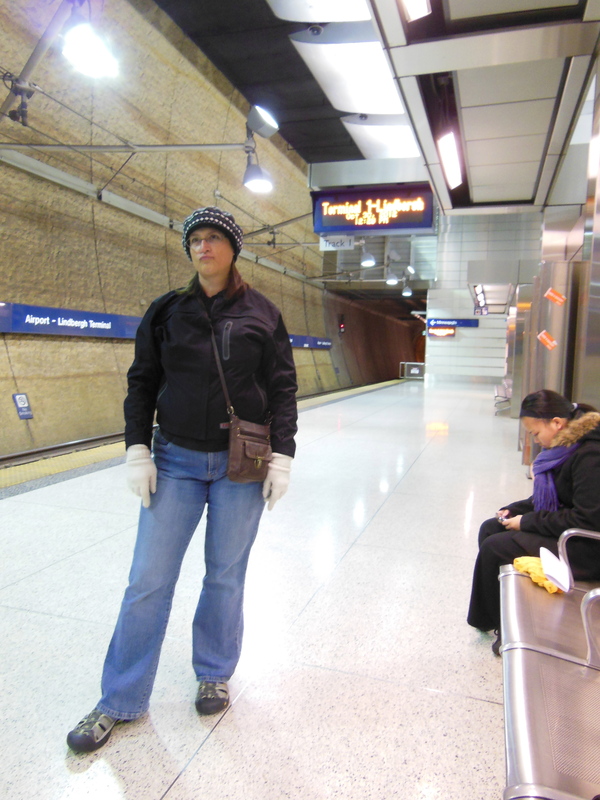 In fact, I’m thinking of creating some Tomboy Sisterhood adventure travel events for like-minded women! Do you have any great travel companions? If so, where have you gone and what have you done on those trips? What hasn’t worked well, when traveling with them? Where would you like to go in the future with a girlfriend or group of friends? I’m off to dream about fun and adventure! You? One of the really cool things about riding a motorcycle on the back roads of America is seeing the awesome landscapes of this beautiful country. Another cool thing is that the flow of my thoughts are often as much of a rush as the wind on my face! One of those thoughts today was about why I enjoy riding. Learning to ride and continuing to develop my riding skills keeps me pushing against the edges of my comfort zone. The benefits of expanding my comfort zone related to motorcycling shows up in other areas of my life. The confidence, excitement and competencies I’ve gained spill over to my career, relationships and other activities I attempt and ultimately master. Even the set-backs are learning experiences that help me grow. I like being a little bit of a pioneer, carving out my unique personality, accomplishments and contribution to this world. My grandmother and Georgia O’Keeffe are just two of the many women who I admire for their modeling of the “can-do, even if many others wouldn’t attempt this” attitude I aspire to. SH is always engaging the locals! Checking emails – it is a workday! Someone probably got a good laugh from my reaction to this toy tarantula on the sidewalk. The Hog Trough BBQ joint in Wickenburg is not open on Mondays, darn! My sweetheart (SH) and I started today with a quick breakfast at the hotel in Lake Havasu City, before rolling down the highway in bright sunshine and crisp air at 59 degrees. We stopped in for coffee at the Early Bird Cafe in Parker, AZ. The landscape in this area is other-worldly, with very sharp mountains (hence the nearby city named Needles, CA) and desolate desert flat land leading right up to the peaks. The region has it’s own lonely sort of beauty, but I can’t imagine living in one of the sun-bleached trailers that are so common along the highway, with nothing but brown sand and a few cactus breaking the monotony of the geography. We had lunch at the Gold Nugget in Wickenburg, AZ, which is a cute, busy town with lots of restaurants and shops. Couldn’t resist having a mocha for dessert at the Bedoian’s Bakery & Bistro while we checked emails and reviewed the map for the final stretch of our journey. The landscape in this area has a little more vegetation and even some farmland, including an orchard we saw along the highway. We hit Phoenix / Tempe about 2:30, dropped off our bags at the Best Western and headed over to Public Storage where SH had arranged for storage of our bikes until Leg 2 of our winter adventure. Our route today included: 95 South to 72 East to 60 East and 74 East, which were all secondary highways before hitting freeways for the last several miles – 17 South, then East on I-10. Lots of sun and the temp broke 90 degrees again today. Another great day of adventure, although it’s hard to remember this is the first leg of a winter adventure, given the temps we’ve been enjoying in California and Arizona! My sweetheart (SH) and I stopped at our favorite Starbucks in Redondo Beach for a latte, and then I had my favorite huevos quesadilla (with corn tortillas substituted for flour to convert to gluten-free) at one of our “usual” spots when we go to visit Uncle Walter — Redondo Beach Cafe. We got a bit of a late start, due to some challenges filling tires with air and the tanks with gas, but nevertheless, we headed east on the 91 freeway at about 9:50 a.m., enjoying the 73 degree temperature. Our path included: 60 east to I-10 to 62 North, lunch in 29 Palms, CA. Then Adobe Road north to Route 66 to Needles, then I-10 to AZ 95 South to Lake Havasu City. Love the history of old Route 66, and it’s a little sad to see all the abandoned businesses and towns along that route. This is truly desert country! The temperature got to 92 degrees at one point (hot for us, cooler for the locals!) I had a reunion with my cousin Dave, whom I haven’t seen in – I’m guessing – 30 years, at dinner in Lake Havasu City. We put about 340 miles today – between the heat and the distance, I’m tired, but it’s a satisfied tired! I’m reflecting on the desolation of the desert landscape, wondering about who lives in the middle of nowhere in this at-times inhospitable climate and environment, and why they are here. How do they make their living? What are the relationships between far-flung neighbors? I saw one sign that said “Next services 90 miles.” WOW, that is remote, even for this North Dakota-born girl! A truly beautiful day in LA – from an delightful morning with the beautiful daughter of dear friends at the Coffee Bean on Figueroa and Exposition to an inspiring afternoon at Uncle Walter’s 103rd birthday party in Torrance to a sunset ride and walk with my sweetheart in Palos Verdes and Redondo Beach. Oh, and the weather was great too! I have a lot to be grateful for! Exactly two years ago this month I passed the exam on a Suzuki 250 to get my first-ever motorcycle license at the age of 52. I had ridden with my sweetheart (SH) on his bike for 2 years, and before that I can remember being on a motorcycle only once before in my life. Although I do remember riding my uncle’s “mini bike” a few times when I was a kid. I bought a 1989 Yamaha Virago 750 and rode about it about 2,000 miles last summer. Today, I rode my Honda ST1300 on the LA freeway (OMG!) to begin what will be a multi-leg winter motorcycle adventure. I’ve ridden this bike, which I bought earlier this year, about 6,000 miles so far this summer. I NEVER dreamed I would take on THIS new interest and live the adventures SH and I have enjoyed the past few years. Yet, here I am – loving it! Airports are great places for people watching! Here, a gracious business traveler from Sri Lanka agrees to let me take his photo and post it on my blog. We shipped our two motorcycles to Los Angeles on a division of Allied Van Lines a couple weeks ago. Today we flew to Ontario, CA, via Denver, on United Airlines. Once in Ontario, we took the Supershuttle to the warehouse where the bikes were waiting for us. We mounted up and headed to Torrance, CA, on the 91 Freeway. After a quick lunch at Panera, we stopped in to visit SH’s Uncle Walter. We plan to attend this witty, delightful 103-year-old’s birthday party tomorrow. But first, we’ll drive Walter’s car to LA to have coffee and enjoy a visit with the daughter (who is a senior at USC) of dear friends in the Twin Cities (Minnesota). Tune in again tomorrow for Day 2, Leg 1 report, and some details about where we go from here! I’d love to hear from you! What are the grandest adventures you have enjoyed? 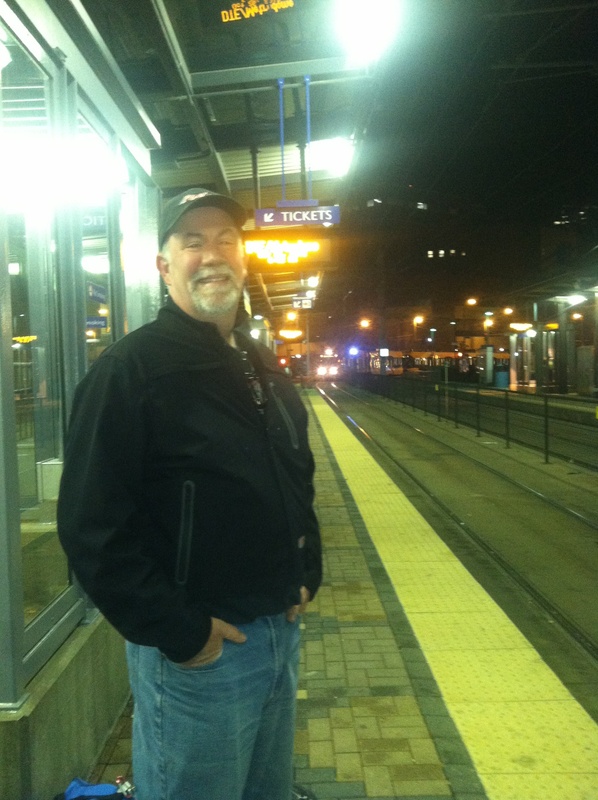 My Sweetheart and I launched our latest adventure at 6 am today, boarding the light rail train in Minneapolis.